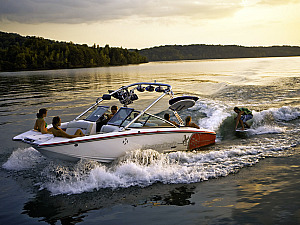 Offering Lake Don Pedro boat rentals and jet ski rental vacations for your houseboating adventure. Located in the Sierra Nevada foothills, on the way to Yosemite, is Lake Don Pedro, east of Modesto and approximately 2 hours southeast of Sacramento. Because of Lake Don Pedro's large size, and over 160 miles of shoreline, Lake Don Pedro is rated as one of California's best recreational lakes with wakeboard boat rentals and chartered lake tours, jet ski rentals, sea doo rentals, paddle board rentals, water trampolines, and watercraft rentals. Lake Don Pedro has hundreds of hidden coves and inlets to use performance speed boat rental, wakeboard lessons, water ski instruction, jet ski rental, wake surf lessons, fish, swim and camp all at Lake Don Pedro National Recreation Area. Lake Don Pedro reservoir shoreline is approximately 160 mi, has submerged some 26 mi of Tuolumne river bed, and has a surface area of about 13,000 acres. The Dam offers several hundred square miles of productive water to the Central Valley farm land. Some of the water is treated by the MID and used as drinking water in Modesto. The two irrigation districts and the BLM control the land 15 feet (4.6 m) above the high lake level, so there are no private boat docks on lakefront parcels. There are three public boat ramps which allow boat rentals, water sport lesson, and waverunner rentals. Enjoy the fun activities of watercraft recreation at these marinas, launch ramps, and resorts around Lake Don Pedro that we service; Mocassin Point Marina, Blue Oaks, Fleming Meadow, Lake Don Pedro Marina.